Wow how exciting to meet your blog friend in real life! It's so wonderful that you had that opportunity to do that. 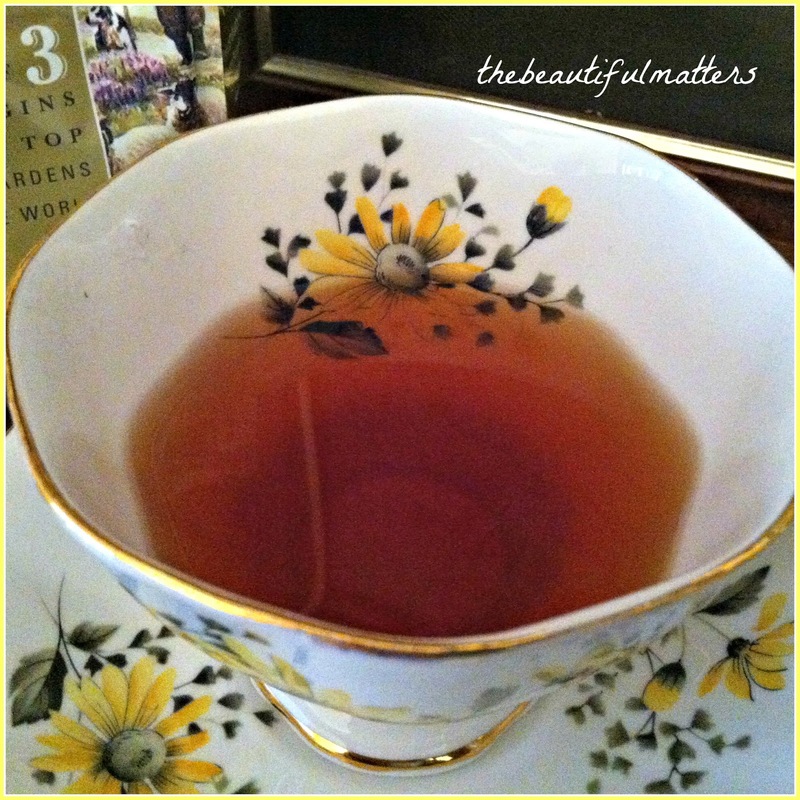 I love Bernideens beautiful blog and I love the tea pot and teacup and the tea sounds wonderful! It's so nice you were able to get away to see family too. How lovely to meet Bernideen. I did the same thing a couple years ago and yes! it is a lovely shop. Beautiful treats too. Wonderful to bring home something special from Bernideen's shop. What a lovely time you had. So great to finally meet blog friends. 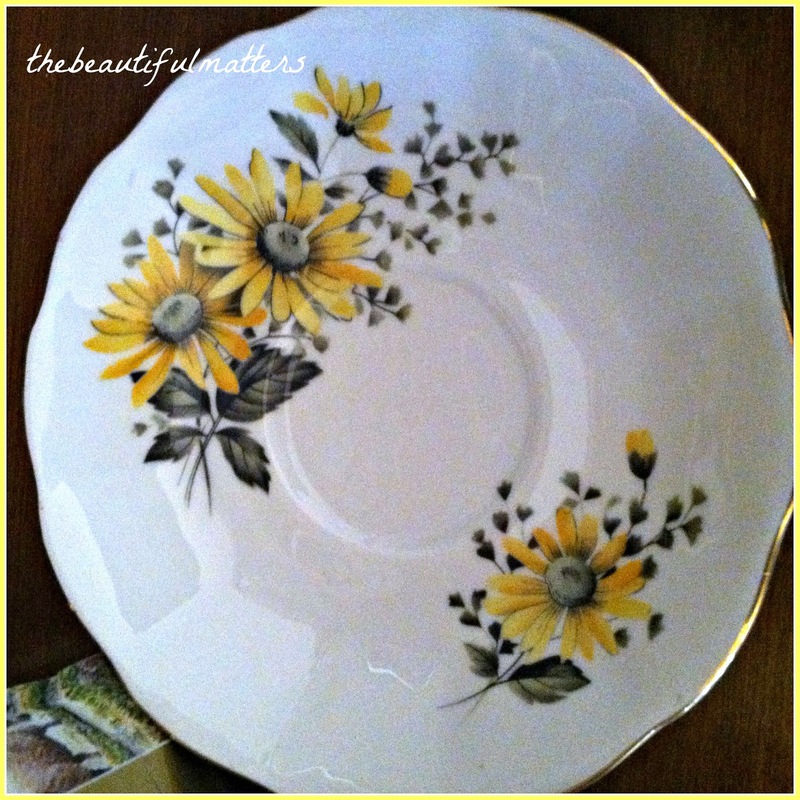 Lovely vintage china. Oh for heaven's sake, Deborah that is just too awesome! So lucky! I am so glad she was there in the shop that day - it would have been a shame to have missed her. I am looking forward to our meeting one day, too - we aren't far away from one another! God bless you and yours this Easter and always. Hugs. How fun to meet Bernideen! I always love seeing photos of her shop and all the neat tea things. 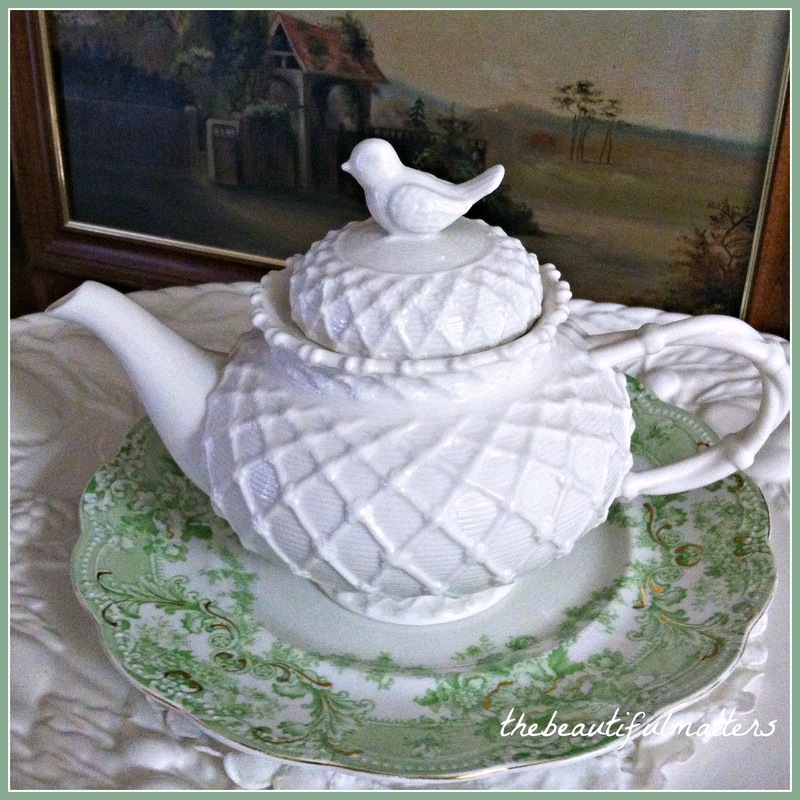 I have the same birdie teapot and use it often. The gifted teapot is pretty and so like our friend to be thoughtful. A nice photo of the two of you Deborah. Oh what fun! That's a lovely tea pot and the tea cup a sweet gift. I agree with Bernideen and you, Yorkshire Gold tea is delicious. I can only find it at TJ Maxx. The pillow is giving me ideas. Isn't meeting Blogger friends just the best!!?? I have had that good fortune and hope to continue. Bernideen's shop is just the type of place I could spend hours in just oohing and aahing over everything. I'm so glad to know she ships to the US. As you know, I have a particular fondness for beautiful handwork, not being blessed w/that ability, myself. You look lovely in that photo, Deborah. How absolutely lovely that you got to meet our friend, Bernideen! And what a lovely picture of the two of you. I don't think it would be safe for me to go into her shop. I would want to buy everything. We don't have too many shops around here like hers. I adore the teapot! Hubby offered to get me that teapot back in the Fall and I said I didn't need it. He told me that I would regret it and of course he was right! I'm glad you got one. I have the taller version but I like the shape of yours better. And what a pretty teacup and very much like Bernideen to surprise you with it. The tea looks delicious too. I'm so glad you shared this with us and joined me for Tea Time. Wishing you and your loved ones a Very Happy Easter. Thank you for sharing your fun visit. I always enjoy hearing about bloggers' meeting face-to-face! 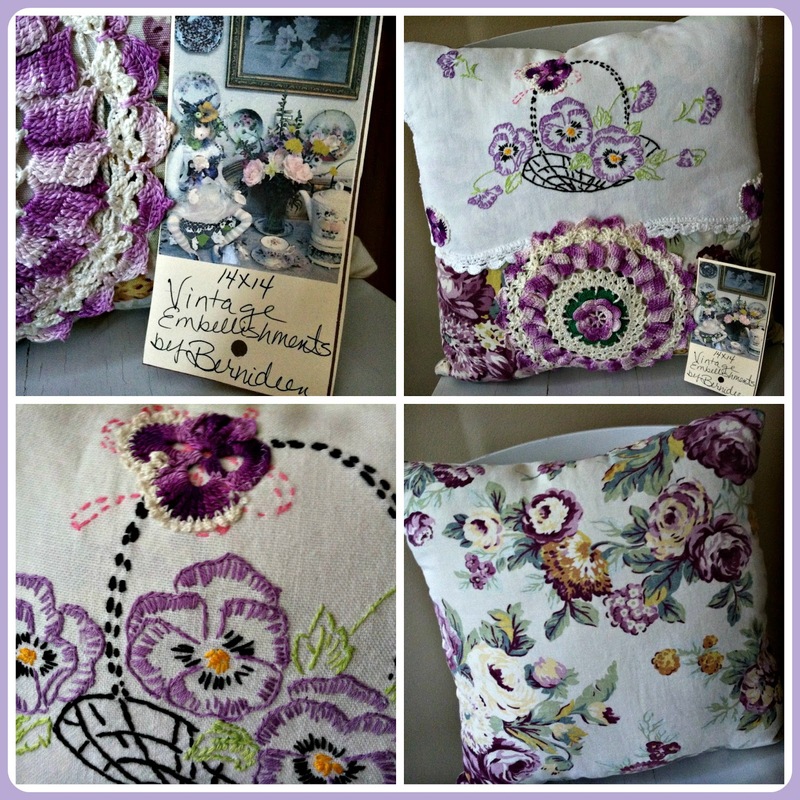 Love your charming new teapot and the beautiful purple pillow. How generous and kind of Bernideen to gift you with the lovely RA teacup! 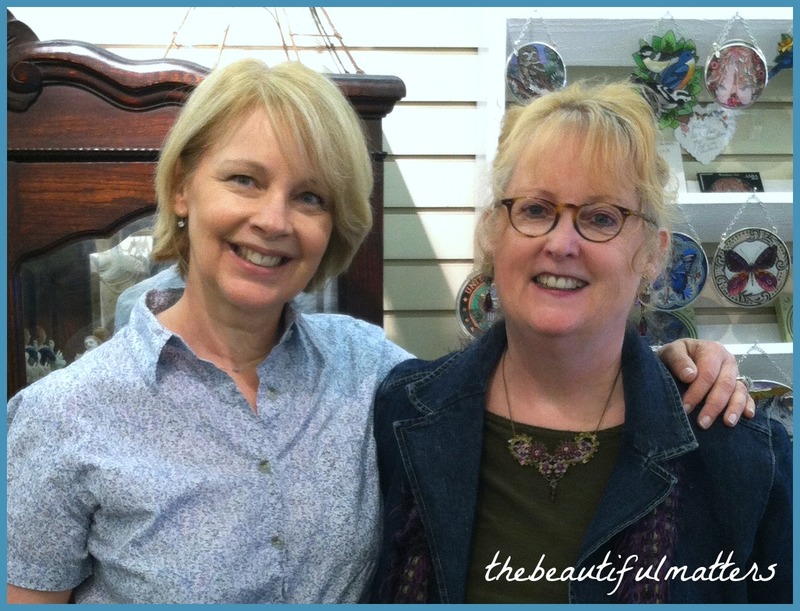 I was so excited when I read on Bernideen's blog that you had visited her shop! What lovely things you bought, Deborah. The teapot is soooo sweet and of course, I love the handmade pillow from vintage linens. Wasn't that sweet of Bernideen to gift you with the teacup?? I love it! I will need to try the Yorkshire Gold tea. Right now, I'm drinking just Yorkshire tea, and I do love it. I'll have to get some Gold and compare it. Happy Easter to you, dear friend. I thought that was so fun you got to spend some time with Bernideen! Wonderful! 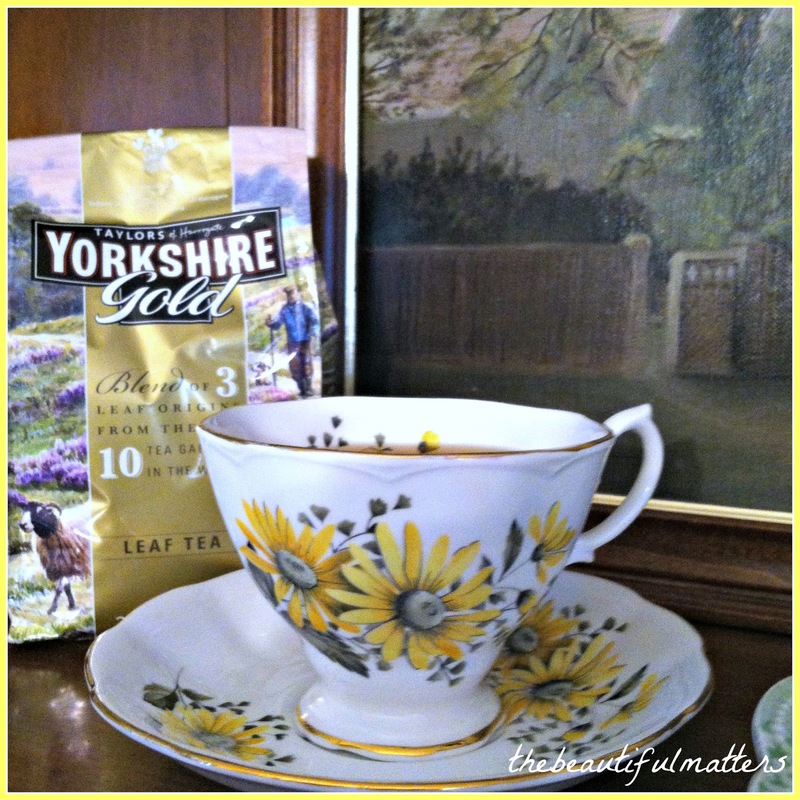 I love Yorkshire gold...a great choice! Love your new teapot and teacup! What a nice day for you to have! And you'll think of it every time you drink from the pretty cup and use your new teapot. I love the pretty pansy embroidered linen (or are they violets?). Isn't it fun to meet blog friends? I think I'd have loved a chance to visit Bernideen's shop - it looks fantastic! That was very exciting indeed and glad you could work it in. A very generous gift from Bernideen and lucky that your precious teapot came home in one piece. We too just got back from a 6-day trip to Arizona, we always wanted to see the finished Hoover Dam Bypass Bridge and the Sedona Red Rocks. Got back on Saturday morning by 2:00 AM and now catching up in the garden and everywhere. What a wonderful get together, such fun to meet up. 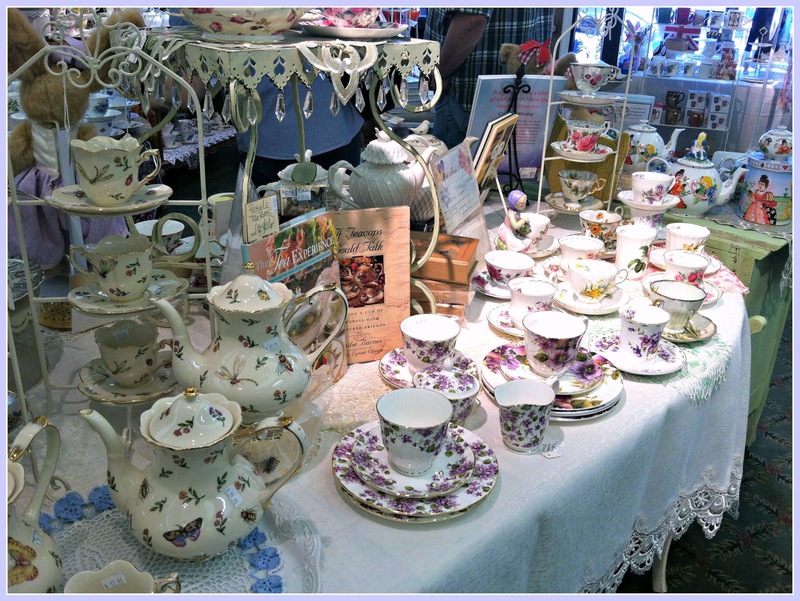 Loved the beautiful teapot and of course the stunning gift such a wonderful pattern, I am a great fan of Royal Albert. How lovely for you to get to visit her shop and meet Bernadine! I'm in love with your new teapot, and what a lovely surprise gift tucked inside. How sweet the two of you look in that photo! I'm absolutely pea green with envy over that pillow! Look at you! 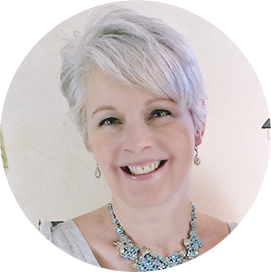 What a delight for you to share, shop and meet your blogging friend! She graced you with a beautiful gift and that tea sounds wonderful, I may have to look for that one. I'm like Vee, that pillow has given me some ideas. Actually, I have embroidered pillow slips of my granny's that I plan on making an apron with some day. You look just beautiful in your photo, Deborah. What a lovely post this was and welcome back. I must stop in and visit your friends blog. What a gift - enjoying the time with family, meeting your blogging friend, and finding the surprise tucked inside. All the items are so pretty, and it looks like you had a really good time. Happy for you, Deborah! Oh boy - here we are in the flesh! So good to meet you Deborah and glad you got everything home safely! I think I have now met 4 bloggers personally who came in my shop and each were lovely ladies! Happy Easter and glad you had a lovely visit to Colorado. 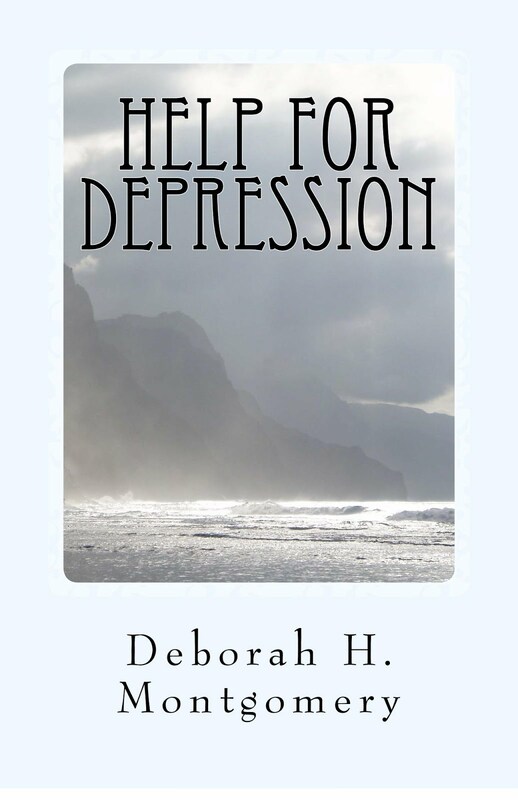 So happy for you Deborah. I have that on my wish list to visit Bernideen's Gift Shop myself someday. You really picked out a pretty tea pot and the pillow is beautiful as well. And what a lovely surprise to find a tea cup in side your box. The shop does look lovely and fun to visit; with way too much temptation! Hi Deborah, it is so special to meet another blogger. Love the pic of you girls. I have meet a few bloggers too and it is really fun. Bernideen's shop looks so inviting and I love her pillows. I tried one several years ago using a table runner my mother stitched. The teapot you found with her is gorgeous and how special and generous she tucked in a little surprise with the tea cup. It is beautiful. Wishing you a very Happy Easter filled with blessings. Yay for you! How fun that you got to meet someone, and what kindness she lavished upon you. The pillow is so unique! Have a blessed Easter. What a totally sweet teapot! I'm so glad you were able to meet a blogger friend; it's exciting and fun. Glad to hear you had a getaway that was fun and relaxing...good for YOU. Oh what a wonderful treat! To meet a fellow kindred blogger! And your teapot is beautiful, so is the teacup! And I love Yorkshire gold tea too! That pansy embroidery basket is so familiar... I think I did that pattern when I was a girl... probably on pillowcases, except I don't have it anymore. It was lovely to see it in your stash of goodies. Wishing you a beautiful rest of the day! A meeting of minds... two bloggers with a shared interest in all things tea - I can't think of anything nicer! Thank you for the little tour of Bernideen's gorgeous shop, I always enjoy her "Friends Sharing Tea" parties and try to join as often as I can. I would love to visit her shop but it's a little too far away for me! Your white teapot is charming Deborah – a good choice as it will go with so many styles and colours of cups. Very kind of Bernideen to pop another sweet surprise into your parcel - bloggers are the nicest people! It's so nice to see a photo of the two of you as well - lovely ladies! Oh Deborah, how delightful to have met Bernideen! I have visited her blog a few times and she seems like a lovely lady :) Her shop looks absolutely wonderful! My mom and I might have to drive the three hours to go pay her a visit. You are so beautiful, my friend :) Thanks for sharing with us. Love and hugs to you! May you have a blessed Easter Sunday! Oh that was wonderful Deborah. I am sure your time spent with Bernideen was fun and full of happy conversation. Her shop looks wonderful. I would love to meet you both someday. Thanks for visiting me Deborah. Wishing you and your family a happy Easter. What a wonderful shop! (I'm drooling with longing to spend a quiet afternoon in a place like that.) And what precious friends!